The 14th annual Half-Pint Resale is here! Get your resuable bags ready and your cheat sheets complete. Fall and winter are right around the corner – and my guess is that there are littles (and school-aged bigs) who could use some new-to-you clothing, some toys, and how about a few birthday gifts stashed away – all on a budget? 1) Volunteers will be wearing black and will be wearing nametags. They are here to help you! 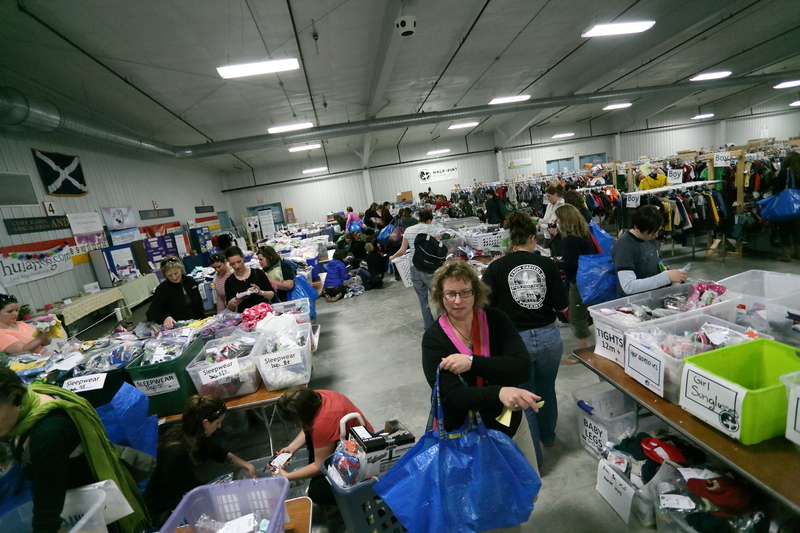 There are a couple of volunteers with special duties that will really help you out: Volunteers in the GEAR/LARGE ITEM AREA will help you purchase large items so you can easily purchase them without hindering the rest of your shopping experience (look for the signs on the wall). Volunteers with a ASK ME ABOUT BABY CARRIERS sign on their backs are ladies who know a TON about baby carriers and will be hanging around in that area during a few hours of the sale to help you try carriers on and learn about what will be best for you and your baby. We hope that these folks will help make your shopping experience better. Read more about the types of baby carriers you might find at Half-Pint Resale on our website, with a guest post by Cynthia Bachhuber, Wraps & Slings South Central Wisconsin. 2) There are two main areas at the Madison Curling Club. In the lobby area, there are tables, seats, and places to just take a load off! Feel free to come in and take a seat, nurse your baby, dig into some food from Slide Food Cart (which will be onsite during lunch and dinner hours Friday during the presales). You are more than welcome to come and hang out – we only ask that you leave all yet-to-be-purchased items on the sales floor. New this year, early in the sale you’ll also find our new area, BIG EXPRESS, which will feature large items that might not otherwise fit on the sales floor, and that you purchase separately from the items on the main sales floor. And good news, you can use your credit card to purchase these items. We’ll hold them there or you can take them right out to the car! The main sale area is in the arena part of the building. We will have hold tables where you could bag your items, if you say, need to go sit and nurse your babe or use the restroom. NOTE: The temperature in the arena area is similar in temperature to the temperature outside, due to the nature of the space. Dress in layers! 4) Strollers are NOT allowed during peak shopping times (anytime before Noon on Saturday). It gets crowded and it would be unsafe for everyone. We also highly recommend you not bring children. We know – sometimes you have no choice! But we’ve had several kids get lost (think kids shorter than the racks and at some peak shopping times, several hundred people packing the space). Finally, Children of any size that are WORN in a carrier are ALWAYS welcome, anytime! If you do bring kids, please make sure that they do not play with the toys or sit in the gear. We’ve had kids break things (and then the item is unsellable) or have had people pass over things they want to buy because they think that they are accounted for, only to find out later that the person using the item wasn’t intending to buy it, and then a consignor lost the sale. 5) Check out all of our tips about holding items on our shopping tips page. PLEASE! Don’t abandon items on this table! Shoppers and consignors alike miss out. 6) Don’t forget to come on Sunday during the Half-Price sale! Everything (excluding rare green-tagged items over $75 that a consignor asked to be excluded from the sale) is half-off! 7) Do you tweet? Post on facebook? Instagram? 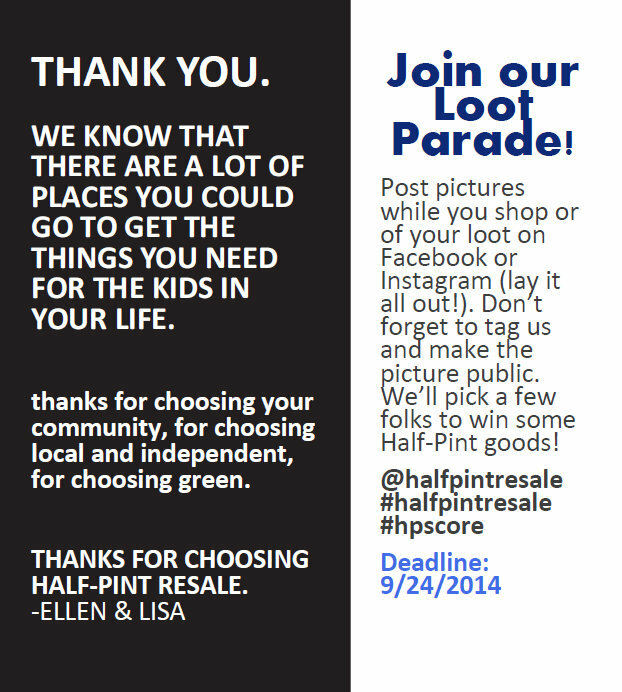 Post your #hpscore after the sale and maybe you’ll win some Half-Pint goods! Also share the event on facebook! 8) Did you know that you can recycle all of your plastic bags after Half-Pint? If you can’t use them again, check out these tips! 8) And last, but not least, We only take cash and check! Keeping consignor checks as high as possible and keeping as much money in the community as possible. PPS – Save a couple of bucks for some super awesome Half-Pint goods such as our awesome Midwest Clay Project handmade mugs (tees and reusable bags still available as well) You can carry the Half-Pint love with you year round.